You’d be a fool to not put the excellent Audi Q7 on your premium SUV shortlist. Audi’s produced some notable cars over the years, but few are potentially as overlooked as the old, first-generation Audi Q7. Of course, it wasn’t strictly a revolutionary car with regards to its concept (by its launch in 2006, premium SUVs had been a thing for many years), but it did prove that Audi could build an objectively good sports utility vehicle. In an ever-competitive market like this one, though, “objectively good” won’t cut it. So, unsurprisingly perhaps, the new Audi Q7 marks a noticeable leap forward for the premium SUV. In fact, we’d go as far to say the latest Audi Q7 is now legitimately right up there with the very best cars this class has to offer. Is there a better interior in this segment? Even materials further down in the bowels of the cabin aren’t the cheaper sorts of plastics and trim you’d expect to find. Audi’s built a name for itself over the years as a maker of extremely high-end car interiors, and the Audi Q7 is a clear indicator of why the firm has such a reputation. Though we understand why some may prefer the relative flamboyance of the cabins in the Volvo XC90 and Land Rover Discovery, there’s no denying the Audi Q7 feels incredibly special on the inside. Overall fit-and-finish, for instance, is right up there with the very best examples this class offers, and very few vehicles available at the Audi Q7’s $55,000 starting price can lay claim to beating the SUV in terms of outright build quality. Even materials further down in the bowels of the cabin aren’t the cheaper sorts of plastics and trim you’d expect to find. The Audi Q7’s also got ergonomics nailed down to a tee, too. All the major controls are easy and intuitive to use, and the Virtual Cockpit system (optional on the mid-range Premium Plus trim; standard on top-spec Prestige) which replaces the traditional analogue gauges with a configurable digital display is both mightily convenient – you can showcase an entire sat-nav display in the screen, if you so wish – and a doddle to operate via the controls on the steering wheel. Interior volume is also pretty good across the board, with lots of head and leg room for those sitting in the front and middle rows. Perhaps the highlight, though, is the gear selector lever handle, which doubles as a rest for your wrist when you’re using the rotary control dial to operate the pop-up multimedia display screen. Interior volume is also pretty good across the board, with lots of head and leg room for those sitting in the front and middle rows (the two seats in the back row, whilst of a decent size by class standards, aren’t exactly suited to accommodating adults on anything other than brief journeys), and a decent amount of storage spots are located around the cabin – ranging from the obligatory door bins to compartments under the front center arm rest. To summarize, there’s very little outside of the rear row space that disappoints us. The only other feature worth including in that list, though, is the cargo volume: at 14.8 cubic feet with all three rows in place, the capacity on offer isn’t especially great (the far cheaper Infiniti QX60, itself not ground-breaking in the three-row SUV practicality sweepstakes, trumps the Audi by one cubic feet), and the 37.5 cubic feet and 71.6 cubic feet volumes available upon folding down the thrrd and second rows respectively also don’t result in class-leading load bays – plus, the Audi Q7 doesn’t have the largest trunk opening in this class, meaning more spacious cars like the Volvo XC90 will be more appropriate if you regularly load your premium SUV up to the roof headlining with gear. The most comfortable premium SUV on sale today? We’re really impressed with how comfortable the Audi Q7 is. Audi does claw back some ground when it comes to day-to-day usability – and especially with regards to overall comfort and refinement levels. Considering many other vehicles in this class (namely the Volvo XC90 and, if you’re not after a seven-seater, the BMW X5 and Mercedes-Benz GLE) are also quite cossetting, it’s not something that’s truly shocking. And yet, we’re really impressed with how comfortable the Audi Q7 is. Granted, the Q7 isn’t perfect in this regard (at lower speeds, the car isn’t totally settled over rougher surfaces and road surface imperfections like expansion joints), but the Audi remains resolutely composed in all other situations. At higher speeds and around corners, body motion is exceptionally well contained, and overall ride quality on the standard suspension setup. Specify the optional air suspension setup, and the Audi Q7 becomes what could very well be the most comfortable seven-seater SUV on the market today. Factor in the superbly supportive seats, and the Audi Q7 becomes a mighty fine companion to have on longer journeys. Refinement levels impress too, with the excellent suppression of wind noise and tire roar resulting in the Audi Q7 being serenely quiet when on the move. Factor in the superbly supportive seats, and the Audi Q7 becomes a mighty fine companion to have on longer journeys. This emphasis on comfort hasn’t had an impact on the Audi Q7’s handling responses. 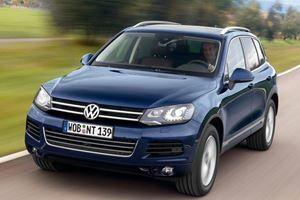 For sure, if it’s top-notch dynamics you’re after in your premium SUV, a Porsche Cayenne or BMW X5 may be the better choice, though it’s worth pointing out that neither of those cars are available in seven-seater configurations – meaning, in this more limited area of the market, the Audi Q7 is at least one of the more enjoyable high-end 4x4s to thread through the corners. It’s worth pointing out, though, that the Audi Q7 does have some fairly chunky front and rear pillars, which do compromise overall visibility somewhat. However, we won’t be too critical of them for multiple reasons: not only is this an issue that affects many other SUVs in this class, but the Audi Q7’s large windows do help offset the pillar-induced blind spots - as do the standard-fit front and rear parking sensors and reversing camera. For sure, the stats are about on par with competing cars with comparable engines under the hood. Though there are plans to introduce more engines to the range, Audi is currently only offering a 3.0-liter supercharged six-cylinder gasoline engine in the Q7. And, whilst the engine itself is certainly rather good, we do wish Audi will bring those extra powerplants in sooner rather than later. Namely, it’s the claimed economy figures of 19mpg in the city and 25mpg on the highway that we feel will limit the appeal. For sure, the stats are about on par with competing cars with comparable engines under the hood, but they do lag behind what rivals with smaller, more efficient engines can manage. For instance, a Volvo XC90 with a 2.0-liter turbocharged four-cylinder gasoline engine can return 22mpg in the city and 26mpg on the highway. Thanks to the broad spread of power and torque, the engine’s rather flexible. Everywhere else, though, the 3.0-liter option is rather marvellous. It’s remarkably smooth and refined, for example, and suits the more relaxing aspects of the Audi Q7’s character exceptionally well. Likewise, thanks to the broad spread of power and torque, the engine’s rather flexible, with lots of pulling power across the large portion of the rev range. 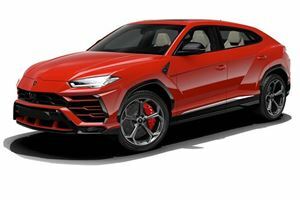 The fact it’s paired with a slick-shifting eight-speed automatic transmission, which sends the engine’s output to all four wheels via Audi’s Quattro all-wheel-drive system, also helps aid the supercharged engine’s flexibility. Put simply, as a powertrain that just gets the job done without a fuss, the Adi Q7’s 3.0-liter gasoline engine takes some beating. Shock horror: the Audi Q7’s competitively priced! On top of the starting prices being similar, a lot of the standard equipment levels on competing cars are also fairly representative of what the Audi Q7 offers. Traditionally, the argument that premium car brands have at least on occasion been guilty of offering expensive vehicles with hordes of equally pricey optional extras has been a valid one – and especially in a marketplace where volume makers are offering as much equipment and practicality as their more expensive contemporaries for substantially less money. 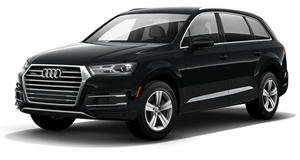 However, that trend has been bucked a little bit by the Audi Q7. Of course, it’d be wrong to say the Audi is an inexpensive car (with a circa-$55,000 starting price, the Q7 is several thousands of dollars more expensive than the Infiniti QX80, Acura MDX and Kia Sorento), but it’s worth pointing out that the Audi Q7’s direct competition do reside in the same pricing and value-for-money ballpark. On top of the starting prices being similar, a lot of the standard equipment levels on competing cars are also fairly representative of what the Audi Q7 offers. For instance, on top of being similarly priced to the Audi, the base Q7’s competitors also for the most part have standard or optional extra access to the tri-zone climate control, parking assists, forward collision warning, and heated front seats which come as standard on all base Q7s. That’s not to say we’re not disappointed with some aspects of the Audi Q7’s spec sheet. A heated steering wheel, for instance, is only available on base spec versions (which have a starting price of $54,800, less we forget) by ticking the $500 ‘Cold Weather Package’ option box, and you’ll need to spend $3,000 on the ‘MMI navigation plus’ package just to get built-in navigation. Safety features on the Audi Q7 are pretty good overall, with the complement of airbags, traction and stability control systems being as comprehensive. Further complicating those matters is that the $59,000 Premium Plus trim. Though it’s not worth considering if you’re only interested in the likes of built-in navigation and Apple CarPlay/Android Auto connectivity (included in MMI nav plus on Premium; standard on Premium Plus), the fact this trim includes features like rear cross traffic alert – a handy goody to have, given the blind spots we mentioned earlier – that aren’t available on the base Audi Q7s means it might be worth considering. Of course, if money is no object, the top-spec, $64,300 Prestige trim with its 19-speaker Bose sound system, four-zone climate control, ventilated front seats and the excellent Virtual Cockpit display will appear very appealing. However, at this level, the Audi Q7 does find itself up against luxury SUVs like the Cadillac Escalade and Land Rover Range Rover – and, whilst we do concede the Audi is good enough to be considered a genuine alternative to those vehicles, it is something we feel is worth pointing out. Safety features on the Audi Q7 are pretty good overall, with the complement of airbags, traction and stability control systems being as comprehensive as they are expected. What is worth highlighting, though, is the forward collision warning system: not only is it standard equipment across all the range, but the feature (which warns the driver and, in worst case scenarios, automatically applies the brakes if it detects an obstacle ahead) also functions at speeds of up to 52mph. As the current Audi Q7 is still a fairly new car, it’s quite tricky at the moment to state with certainty how reliable it’ll be. That said, the early signs are fairly reassuring (a lot of the tech featured in the Audi Q7 has been featured on other, newer Audi models), and the four-years/50,000-miles warranty is decent by auto industry standards. 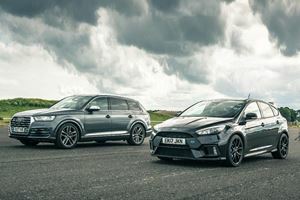 Can You Predict The Outcome Of A Ford Focus RS Vs Audi SQ7 Drag Race? This is a much closer race than we'd ever expect it to be. But there's a specific diesel engine this offer is good for.